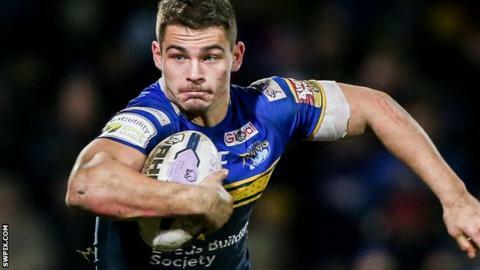 Leeds Rhinos loose forward Stevie Ward is urging professional sportspeople who are battling depression to "be honest" about their "struggle". Ward, 22, has suffered with a series of injuries since 2015 and is currently sidelined with a knee problem. He has established an online magazine, Mantality, which encourages people to open up about their struggles. "I had depression in 2014 and you don't value anything you do," Ward told BBC Radio Leeds. "You're in a low mood all the time and you don't value what you say or do. You struggle to get out of the house as much as you do when you have a broken leg. "It's not spoken about so let's speak about it - let's be honest." Ward made his senior debut for the Rhinos in 2012 and enjoyed a prolific 2015, becoming Leeds' leading tackler and scoring four tries before injury ruled him out of their Grand Final appearance. He has missed the start of the 2016 season after having an operation on his knee and is still two months away from being match fit. The Leeds-born player wants to use his online magazine to give others an insight into the life of a professional sportspeople and the struggles they face. "I'd be fit, be injured, go through a long period of rehab, play again and win something then get injured again," he added. "If I can start a trend on people telling you what the real version of being injured is, what adversity means to me and my experience, then so be it."